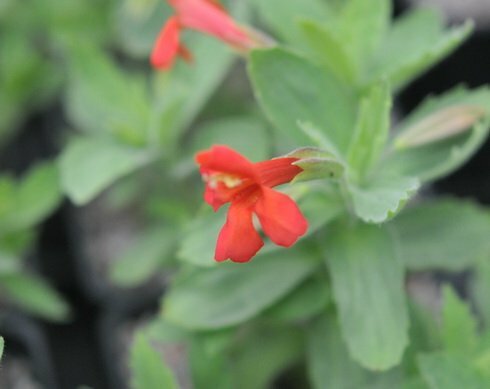 Rich orange/red flowers on 10 cm stems in summer over attractive foliage. 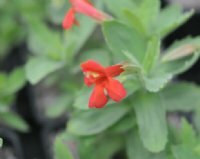 Named by Axel Rydberg after an exceptional botanist Alice Eastwood after finding it growing in rocks in Utah. An exceptional rock plant which grows from slender stolons but not invasive. Foliage is around 4 cms long and 1 cm wide, being a soft sage-grey green and held on stems to around 10 cms high. The flowers are very attractive being tubular and maybe around 3 cms long and half as much wide. A rich orange/red in colour and lasting around one week each. Multiple flowers per stem in the season. Excellent in a trough or allowed to slowly run in the rock garden.